Greetings and blessings to each of you. I hope you all are experiencing a meaningful Lent. Listed below are some opportunities to witness for life on your Lenten journey. immediately. More info is available, and dinner and raffle tickets are on sale now at prolifedallas.org/dinner. Apr. 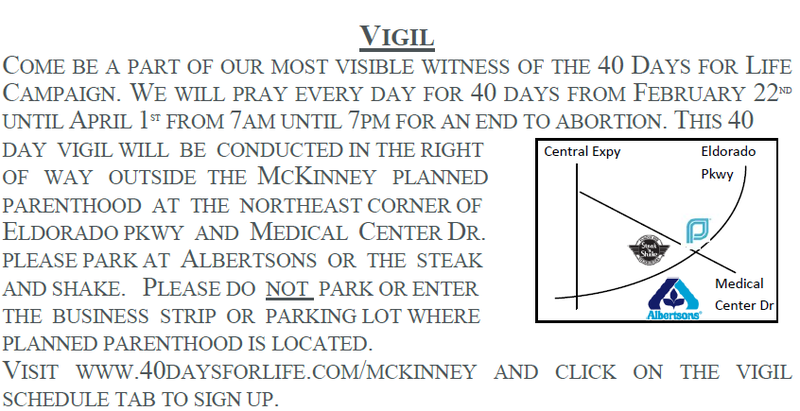 6 at noon, Good Friday Pro-Life Stations of the Cross, Southwestern late-term abortion center. With the permission of your pastor, these materials are great teaching tools for your parish! Finally, I wanted to share a note of congratulations. On February 11, Bishop Farrell presented the first “Bishop’s Award for Service to the Church” to lay men and women. I am happy to announce John Arney – the Parish Pro-Life Coordinator at Blessed Sacrament – was among those who received the award!